There was a time when we were overwhelmed with World War II first-person shooters. Now it feels like we're overwhelmed with modern military shooters, and I'm about ready to head back to WWII's familiar battlefields with new graphics and new ideas. Namco Bandai's and CI Games' Enemy Front seems like will offer just that kind of ride. 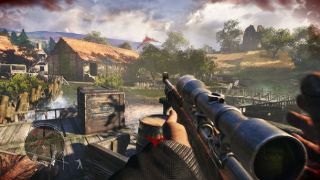 This first extensive gameplay trailer shows typical WWII shooting, but also some stealth mechanics, interesting ways you can use physics and the environments to you advantage, as well as sniping gameplay, with dramatic bullet-time shots that look awfully similar to Sniper Elite . The game is built with Crytek's CryEngine, so it looks predictably beautiful. Enemy Front also chooses to focus an interesting aspect of the conflict. Rather than returning to Normandy and Stalingrad once again, it puts you in the shoes of an American war correspondent who aligns himself with resistance fighters, mostly during the Warsaw Uprising of 1944. That battle didn't end well for the the Polish resistance fighters, so it'd be interesting to see how far CI Games will go in portraying gruesome history accurately. A previous teaser for the game indicates that it will go pretty far. Enemy Frost is set to release on June 10, 2014.